Marriott International’s Moxy Hotels announced 6 new openings throughout the Southeast of the U.S.
Marriott International’s experiential hotel brand, is expanding in the Southeastern U.S. with the recent opening of Moxy Chattanooga Downtown and the anticipated openings of Moxy Atlanta Midtown, Moxy Memphis Downtown, Moxy Nashville Vanderbilt at Hillsboro Village, Moxy Nashville Downtown and Moxy Louisville. Moxy Chattanooga Downtown was the first to open in November, with the remaining openings expected to follow in 2019. The brand appeals to the young and the young at heart and encourages its guests to play on. Moxy offers a new way of traveling in which smaller is concentration, not reduction – where affordability is not a sacrifice of style, nor a loss of comfort. From the communal NOW public space to smart, flexible bedrooms, Moxy is a bold, surprising design for the socially extroverted, energetic consumer. The style features an industrial chic look and aesthetic of polished concrete floors, exposed concrete columns, and open ceilings. Moxy Louisville, slated to open in November 2019, is situated in the historic and revitalized Whiskey Row neighborhood of downtown Louisville and steps away from the KFC Yum! Center. The 110-room hotel, developed by White Lodging, Poe Companies and REI Real Estate Services, is designed by HKS, Inc. and FlickMars. Opening in the city known for its famous horse races, foodie mentality and southern charm, Moxy Louisville will welcome guests with locally inspired contemporary design, industrial chic style and a playful social scene. The social scene caters to guests and locals alike and will include Bitter’s End, a rooftop bar serving whiskey-inspired small plates, original drinks, and plenty of good old-fashioned bourbon; Zombie Taco, a 24-7 food truck inspired concept complete with a walk-up takeout window; and Bar Moxy, featuring a curated music program with activations including spinning DJs and a podcast booth. 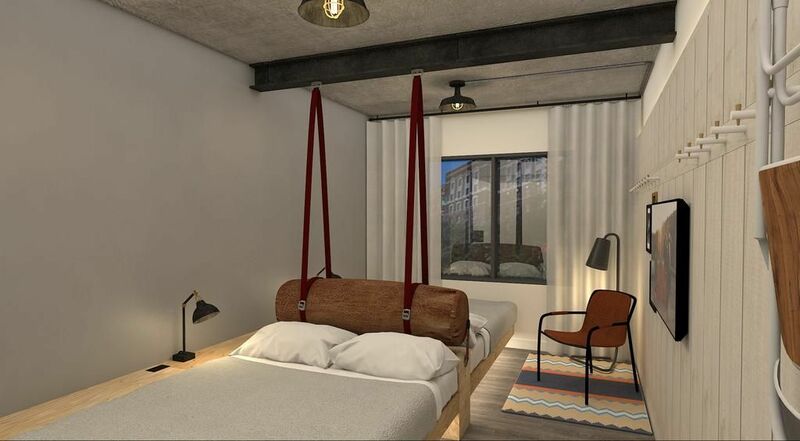 Moxy Louisville is dual branded with Hotel Distil, a Marriott Autograph Collection Hotel, which also is targeted to open in November 2019.